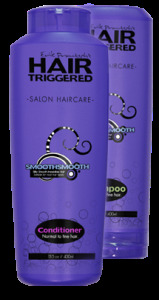 Erik Prautsch’s HAIRTRIGGERED is proud to announce that, for a limited time, users may sign up here to receive a free sample of their newest product line, SMOOTHSMOOTH Shampoo and Conditioner! Offer includes two Free sample-sized bottles of shampoo and conditioner, shipping is Free. * Maximum one per household, available to residents of the United States exclusively. HURRY!! This probably won’t last long. Said my samples are on the way and should arrive in 6-8 weeks. Yay! GO HERE to visit their main website and see other product lines. Awesome! I just signed up for the freebies! Thanks!